I bought this book ages and ages ago (maybe 12 years? ), and although I read it when I first got it, I have to honestly say it’s been sitting on the shelf, mostly unwanted. It’s managed to survive a few move-induced book purges, so there must have been something I liked about it. I just couldn’t remember what. Thanks to the Classics Challenge, I got it off the shelf, dusted it off, and cracked it open to see if I could remember what I liked about it. Babbette’s Feast is the short story that I enjoyed, and the remembered reason for keeping the book. It’s set in Norway. Two sisters of a fairly Puritan sect run by their father take in a refugee from the French Revolution, Babette. She lives with them for 12 years, and then one day, she informs the sisters that she won the lottery and is the recipient of 10,000 francs. Babette decides that what she really wants to do is cook a meal for her benefactresses, and cook she does. Unfortunately, they don’t quite understand what that means until it’s almost too late, yet, in the end, realize what a work of art and grace and service the meal was. I had misremembered it as having a magical realism slant, which it doesn’t. However, that doesn’t mean it wasn’t thoroughly captivating. Actually, at one point, I thought that it reminded me quite a bit of A.S. Byatt’s writing at its best: beautiful, evocative, dense, and somehow sublime. 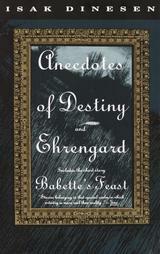 The novella, Ehrengard, is much like Babbette’s Feast in its descriptiveness. It’s peripherally the story of a prince and princess who fall in love, but don’t quite manage to wait until their wedding day. In the need to cover up the royal faux pas, the Grand Duchess consults with Herr Cazotte, a famous artist as to what to do. They decide to send the prince and princess off to a remote mountain estate and surround them with people who are very loyal and very trustworthy (of course, Cazotte will be included). Among the people is Ehrengard, a daughter of a retired general. She’s beautiful, loyal, and Cazotte decides that he must paint her. However, he doesn’t just want to paint her, he wants to capture her, make her his own, so that the whole world will know that she belongs to him (I never could quite figure out if this was sexual or not…). At any rate, the plot is immaterial. Again, it’s Dinesen’s language that makes the story compelling. Her descriptions, the passion in which Cazotte is captivated by Ehrengard. What Dinesen doesn’t do is endings, which I think is part of the reason I didn’t like the other stories. They wrap up, but somehow I’m always left feeling like there should have been something more, like I was left dangling in the wind. They — even the ones I like — feel unfinished. I’m sure it’s something she did on purpose, but that doesn’t take away the unfinished feeling I had when I was done reading. Even with that, though, the two stories were enjoyable to re-read. And so the book will remain on the shelves for the time being. Babette’s Feast has been into a movie, you should check it out. Lovely movie! I have seen the movie, but it’s been years and years (back in college, I think). I was thinking while I read it, that I wanted to see the movie again. I do remember it being quite lovely.